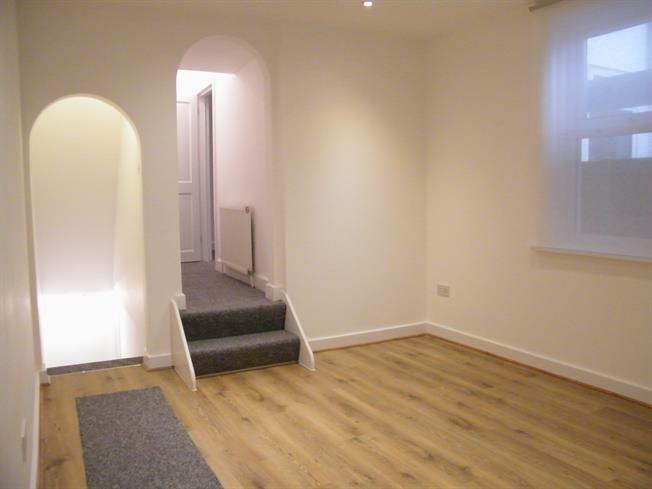 This newly converted split level apartment features a its own private garden as well as parking. The property benefits from two double bedrooms, one with a shower as well as a modern fitted bathroom and a fitted kitchen with integrated oven, hob and hood. From the lounge at the heart of the property stairs lead down to the master bedroom with its own direct access to the garden. The property benefits from gas central heating and will have a new lease on completion. No onward chain. Refitted with a range of base and wall units with attractive, complementary work surfaces over and space for appliances. Step up to lounge and door way through to lobby. Fitted with a white suite with panel enclosed bath with shower over, low level WC and wash hand basin. Tiled floor and walls. A side aspect room with steps up to inner hall way that leads to bedroom two and stairs down to bedroom one. A rear aspect double bedroom with en-suite shower. With stairs down from the lounge this double bedroom also benefits from its own access to the outside via a double glazed door. Useful under stairs storage space. The property is approached from the rear over a private parking area leading to the courtyard rear gardens.